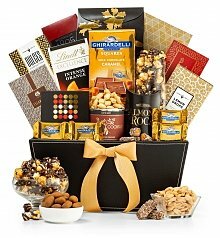 Share your pride and praise with one of our exciting congratulations gifts. 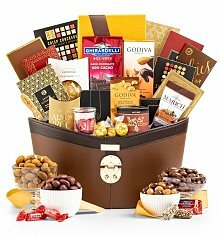 When there's been a crowning achievement, a job well done, or an occasion that's cause for celebration, mark the occasion with a monumental gift - one that will be enjoyed upon receiving and remembered long after. 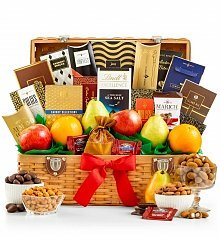 Our team has carefully selected the best bottles of champagne, decadent fruit and chocolate baskets, bountiful flower arrangements, and more for a thoughtful, unforgettable congratulations gifts. Looking for a gift for the nephew who's just graduated college, the happy couple who just became first time homeowners, or the daughter who landed that fantastic new job? Shower them with praise, congratulate them on a job well done, and surprise them with thrilling, impressive congratulations gifts from GiftTree. One look through our expertly curated selection and we're sure you're going to find an inspiring, thoughtful and unique way to say "Congratulations! 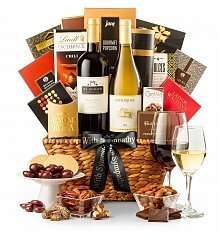 ", like our Cheers to You Champagne Basket - luxury champagne paired with gourmet chocolates, artisan cheese, smoked salmon and so much more, arranged in a leather keepsake serving tray that they're sure to use in the new home or maybe even in the new office. 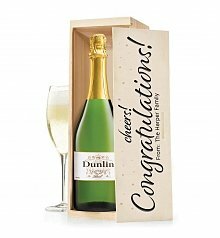 Whichever congratulations gift you choose, you can trust that your gift will send your happiest wishes and biggest congratulations to everyone who receives it.